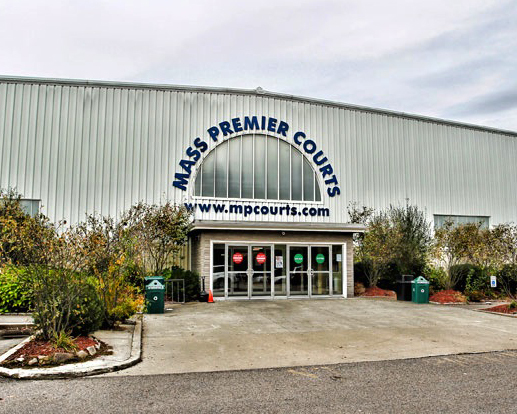 A Better Game Experience for the Player and the Spectator..
Mass Premier Courts offers six regulation size basketball courts. 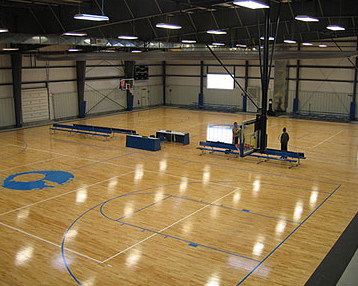 Two of the courts are made of high-quality maple wood, and are similar to the flooring used at the practice facility of the Boston Celtics. The remaining four courts are made of a 14mm “pad and pour” high-end synthetic surface. This is the best synthetic court available on the market providing the most comfortable experience for the players. It is used at the Boston College field house, and the new sports facility at Bridgewater State College. 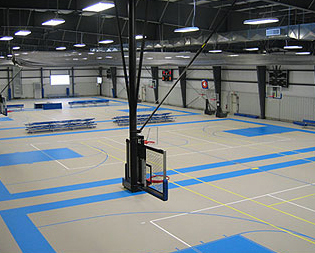 Every basketball player has played on wood and synthetic courts, but none match the quality of Mass Premier’s. The hoops are made by Porter Athletics and are their newest model. Each backboard is glass, and each rim features 180 degrees of breakaway capability. T he rims at most facilities are stiff, and can only break away at the front. As a result, not as many shots fall and the paths of the rebounds are errant. The accuracy and simplicity of this adjustable goal make it superior in design and performance for the highest levels of both NCAA and FIBA competition requirements. Gone are the days of poorly lit courts and dark gymnasiums that make both the player and spectator feel as if they are in a dungeon. Mass Premier Courts’ lighting system operates at twice the lumins (the lighting level) at most high schools located in New England. The lighting system at Mass Premier Courts is better than that of most college field houses, and is just shy of the lighting systems of Division 1 colleges and uni- versities, in terms of lumins. Spectators and players alike spend far too much time sitting on stiff stools eating stale popcorn while wait- ing for the next game. We have made sure that will not be the case at Mass Premier Courts. 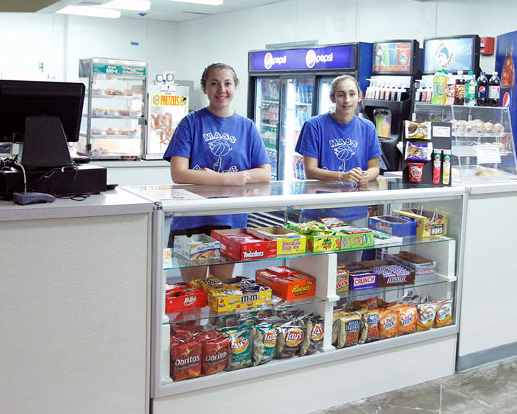 Treat yourself to the enormous 4,000 square foot concession area that we have to offer. The concession stand, which offers various foods from an expanded menu, is located in what is the largest sitting area of any indoor basketball facility in New England. Comfort was the mindset in designing the concession area, and to reach that goal the area is fit with couches and televisions. Another accommodating feature of Mass Premier Courts is its heating and air conditioning system. This allows year round practice and gaming capability, and helps shield players and spectators from the cold of winter and the humidity of the summer. The temperature can be regulated by the staff, which ensures a comfortable atmosphere for the both the players and spectators. No longer will players be forced to play in uncomfortable temperatures. Mass Premier’s top of the line ventilation system makes it feel as if you are at a first class office building, not a warehouse. 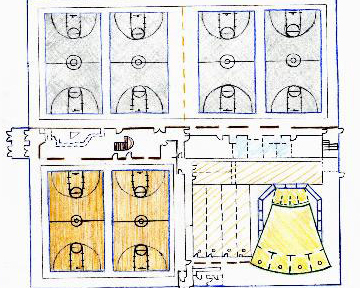 This is an exact drawing of the inside of Mass Premier Courts. 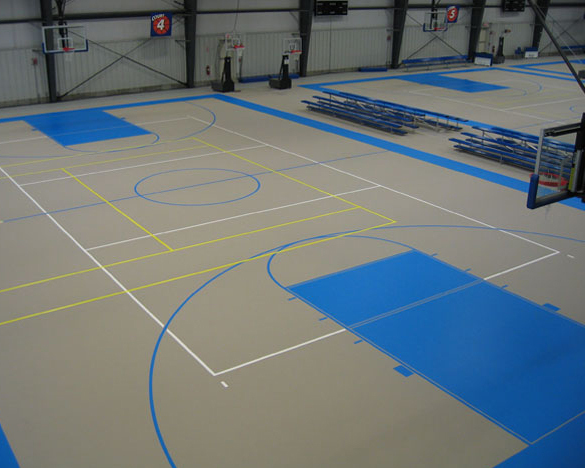 The grayish courts are the 14mm “pad and pour” synthetic surface, and the brown courts are the high end maple wood flooring. Each court will be divided by a curtain, which will give the game a more peaceful, rather than chaotic feeling. The bathrooms, located in the middle of the drawing, are near the 4,000 square foot concession area. Above the concession area, and located in the absolute middle of the facility is a 14 foot high catwalk that offers ample space to get a clearer, birdseye view of the action. Head Boys basketball coach at Mansfield High School. A former assistant at both Franklin & Mansfield H.S. He was a standout player at Mansfield High School. As the Head Coach of Three AAU teams, his squads have qualified & participated at regional & national levels. The Framingham State graduate will oversee all activities offered by Mass Premier Courts. Andrew is a 2006 graduate of Lock Haven University of Pennsylvania, with a BS in Recreation Management. He has been a coach with Attleboro Basketball since 2010, including teams at the town level, MetroWest travel league, volunteer assistant coach at the high school and is currently the Freshman Boys coach at Attleboro High School. Dan is a 2009 graduate of Emmanuel College, with a BS in History, he later earned his Masters from Northeastern University in Sports Leadership in 2011. Dan has had successful stints as the Head Girls Basketball Coach at both Bellingham High School and Worcester Academy, as well as at the collegiate level at Fitchburg State University. 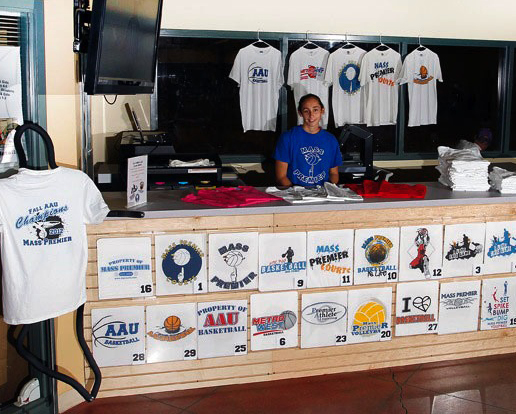 Dan will oversee all of the camps, clinics, and leagues offered at MP Courts. Sadye comes from an educational background working with children. Her focus has been personal development and building self confidence. She is currently working on her personal trainer certification with a target of youth fitness and a goal of showing kids how to have fun while improving their sports skills. Sadye's life motto is "A healthy body is a healthy mind." Joey is a 2016 graduate of James Madison University, graduating with a B.B.A. in Finance and a B.S. in Sport & Recreation Management. Entering his 2nd season as the Freshmen Boys coach at Mansfield High School, Joey played for Mansfield High, graduating in 2011. Joey also coaches at the high school level for Mass Premier’s AAU program. A business executive and entrepreneur and is the driving force behind the new facility. His corporate career has found success based upon his philosophy of customer satisfaction. He & his family are residents of Mansfield. 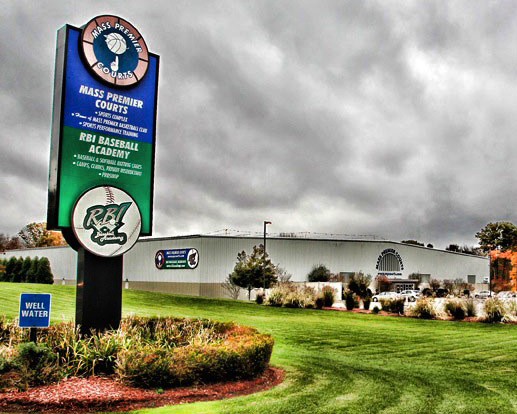 Mass Premier Courts offers open gym time to anyone interested in playing basketball. The fee is $8. It is recommended that people interested in utilizing our open gym call ahead because open gym time is only offered when our courts are not already booked. 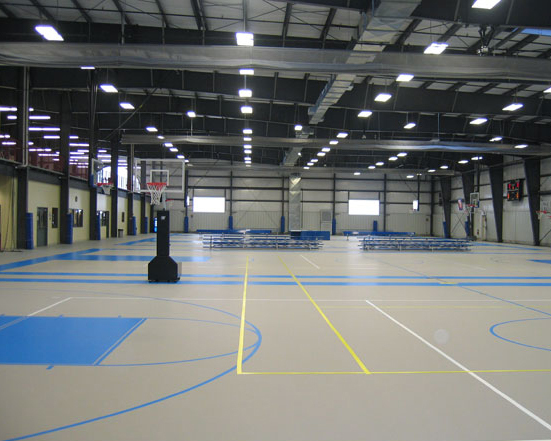 If someone comes to Mass Premier Courts to use our open gym and no courts are available they will not be able to play.